Käthe Kollwitz and Sue Coe at Galerie St. Etienne. Sue Coe, Vigilante, 1985. Mixed media and collage on canvas. Signed and dated, lower right, and titled, upper margin. 96 x 120 in. All Good Art is Political: Käthe Kollwitz and Sue Coe is the ambitious and problematic endeavor just installed at Galerie St. Etienne. Very few artists, perhaps none of them living, are comparable to Kollwitz in this arena. (For the record, Kollwitz didn’t consider herself a political artist, in that she had no affiliations with a particular party). To make Ms. Coe a co-star, and to allot her dominance in the physical presentation, is to put her in an unenviable position. It is a stretch to present her as Kollwitz’s heir. Sue Coe, Safe at Last (Rescued), 2016. Linocut on thin white wove paper. Signed and dated, lower right; numbered and with red bird stamp, lower left. 7 3/8 x 6 in. From an estimated edition of 100 impressions. Reproduced in The Animals’ Vegan Manifesto, p. 113.
the inequities of her time; she has covered the waterfront of social commentary since the 1980s. A reliable theme—as in the low-hanging fruit of a print that depicts Donald Trump sexually assaulting the Statue of Liberty—is the inequity of victim and victimizer, with dignity accruing to neither. 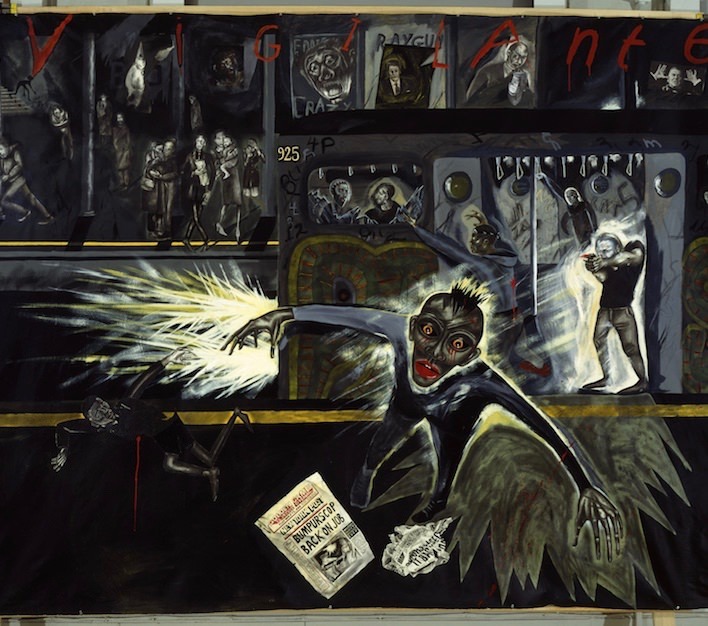 Choosing subjects from the news and personal experience, Coe wields a cudgel; in the large canvas Vigilante, several racially charged mid-1980s shootings are conflated in a nightmarish nocturne and punctuated by the cartoon-like blaze of gunfire. In her small prints, the designs are most successfully distilled to graphic simplicity. 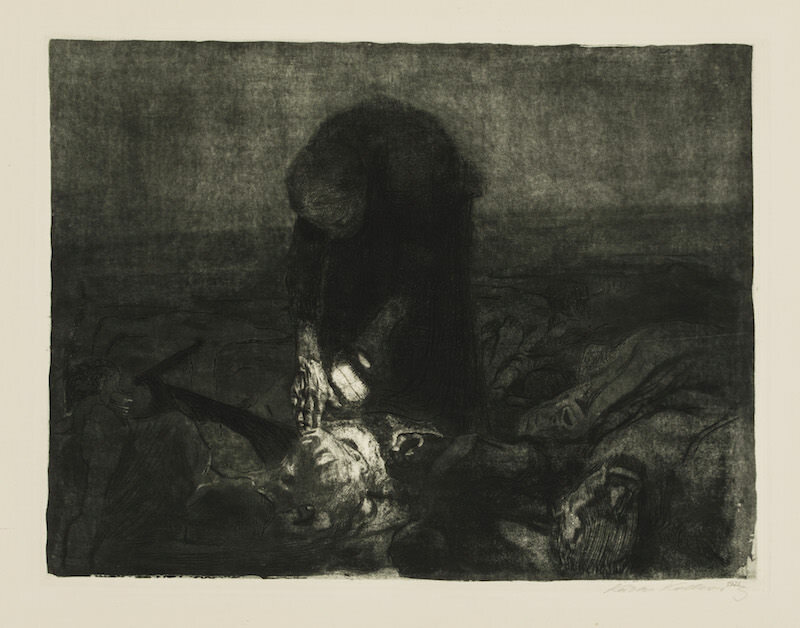 Some of these works borrow freely from the masters—Tragedy of War is an homage to Goya, and Safe at Last (Rescued), is a linocut whose imagery and technique derive unapologetically from Kollwitz’s The Widow I. 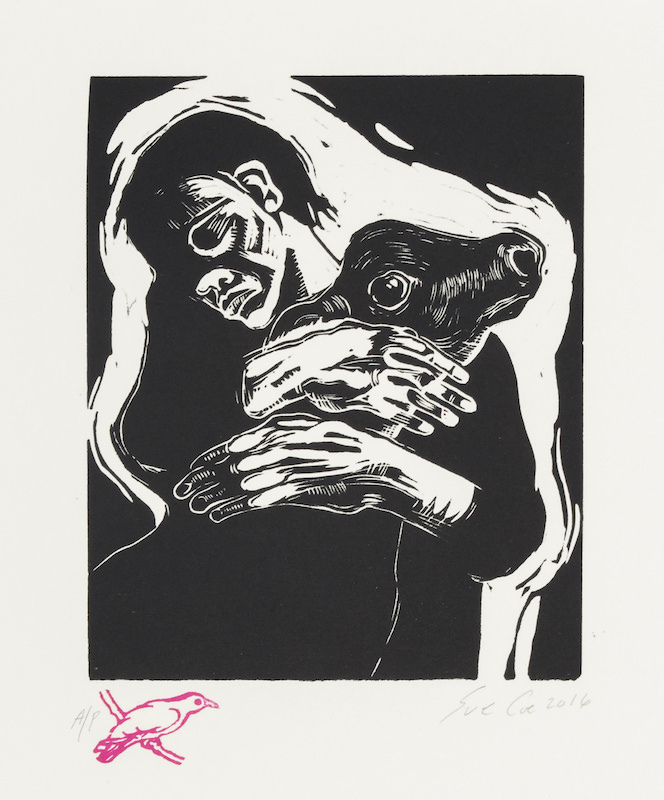 In Coe’s telling, a maternal embrace is given not to a human child but a livestock calf. Appropriating the image on behalf of veganism won’t work for everyone, but it’s heartfelt. In this show, the calf is her most sympathetic victim. Käthe Kollwitz, Outbreak/Charge, 1903. Etching on heavy wove paper. Signed, lower left. 20″ x 23 3/8″ (50.8 x 59.4 cm). Plate 5 from the cycle Peasant War. From the first edition of approximately 300 impressions published in 1908. Knesebeck 70/VIIIb. Daniel Stoll and Sibylle von Heydebrand Collection. certain twentieth-century cartoonists, the way my father used to admire the panel-by-panel inventions of Roy Crane or, later, Bill Watterson; lately in one of my classes we’ve discussed Art Spiegelman’s graphic novel Maus. Kollwitz’s Peasant War cycle presages, both technically and in content, much of the narrative black and white art that’s been drawn since. Among etchings from the cycle is Outbreak/Charge, which depicts a mob on the attack (years ago, I was fortunate to temporarily store a copy in my studio, where its incitement to revolution was interpreted as an exhortation to paint honestly). This is followed by The Prisoners, a mass of peasants now subjugated in shared captivity; the individual heroism of Rodin’s Burghers of Calais has been lost within the crowd, a condition that foreshadows prison and concentration camps. Better still is Woman with Scythe, a haunting close-up of the weary subject huddled over her implement, starkly lit and unmatched in the beauty of its velvety grays. Yet for emotive force Kollwitz surpassed even these, with more personal subjects that travel further into silent unimaginable realms: Raped, in which an inert and anonymous female figure lies half-hidden amid an overgrown garden of grass and flowers, and Battlefield, wherein a mother sifts through bodies in the night looking for her son, the light of the lantern she holds in one hand throwing into harsh relief the weathered forms of the other. 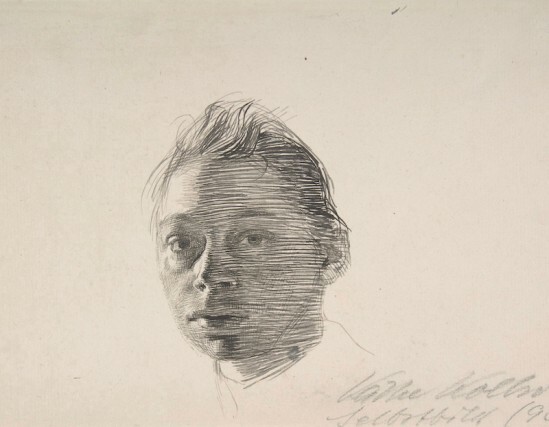 Enumerating these prints is like listing a collection of Kollwitz’ greatest hits, as well as maybe the finest clutch of etchings produced in the twentieth century. 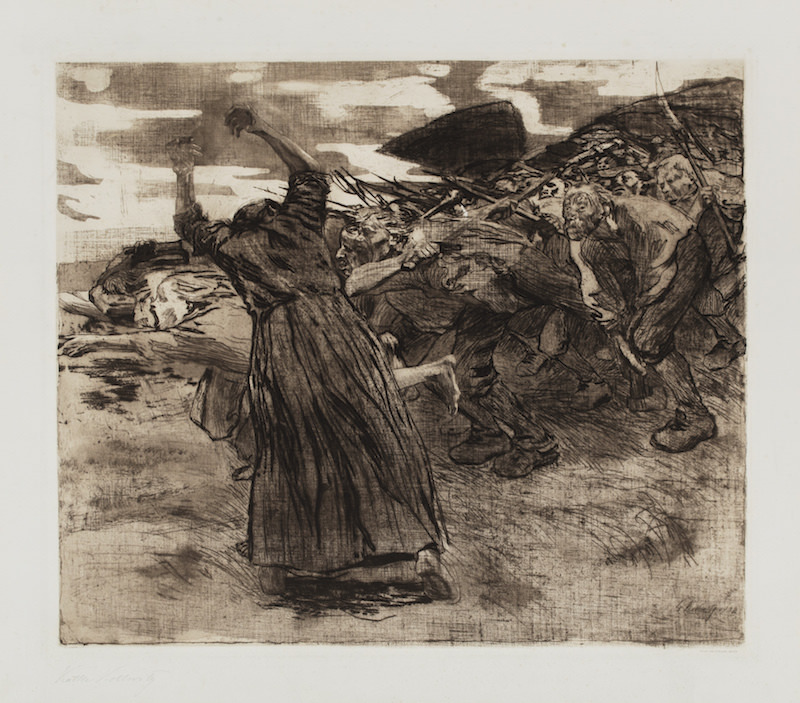 Käthe Kollwitz, Battlefield, 1907, etching on heavy white wove paper. Signed, lower right. 16 1/8″ x 19 7/8″ (41 x 50.5 cm). Plate 6 from the cycle Peasant War. From the first edition of approximately 300 impressions published in 1908. Knesebeck 100/Xb. In the first years of the twentieth century, Kollwitz’s temperament was astonishingly well-suited to the light and texture of proletarian life. 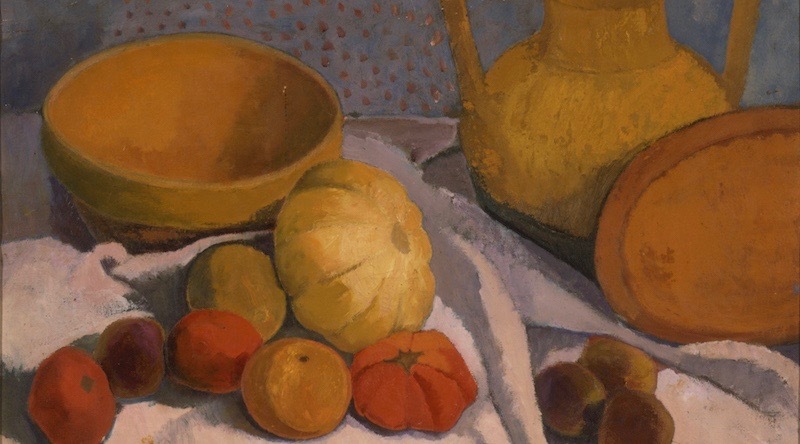 After the first war, she worked increasingly in lithography and woodcuts, and her scalpel-sharp naturalism broadened out to more abstract expression. Surroundings were eliminated, and the figures alone were all that mattered. One hates to fall into the “I like the early work” refrain, but it’s true for me nonetheless, and saying so detracts nothing from Kollwitz’s later art. 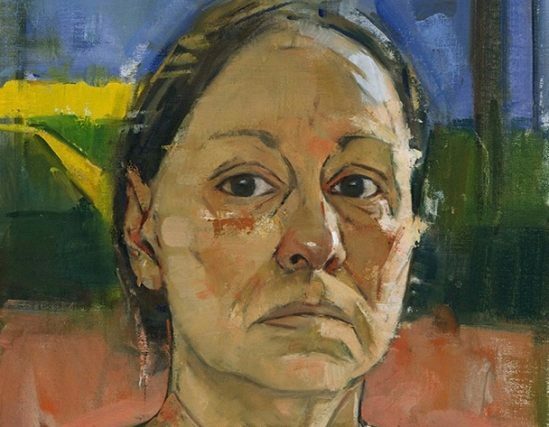 Even her most propagandistic art was driven by humanism, and it was always beautifully drawn. All Good Art is Political: Käthe Kollwitz and Sue Coe continues at Galerie St. Etienne through February 10, 2018.